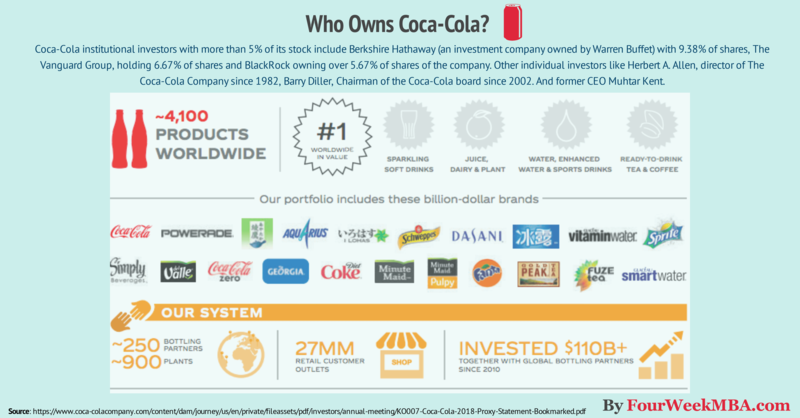 Coca-Cola institutional investors with more than 5% of its stock include Berkshire Hathaway (an investment company owned by Warren Buffet) with 9.38% of shares, The Vanguard Group, holding 6.67% of shares and BlackRock owning over 5.67% of shares of the company. Other individual investors like Herbert A. Allen, director of The Coca-Cola Company since 1982, Barry Diller, Chairman of the Coca-Cola board since 2002. And former CEO Muhtar Kent. Who is Herbert A. Allen? What is Coca-Cola incentive formula? How does Coca-Cola distribution system work? What brands does Coca-Cola own? Director of The Coca-ColaCompany since 1982. Mr. Allen is President, Chief Executive Officer and a Director of Allen & Company Incorporated, a privately held investment firm. Director of The Coca-Cola Company since 2002, he is also Chairman of the Board and Senior Executive of Expedia Group, Inc. Barry Diller has also served as Special Advisor to TripAdvisor, Inc.
Muhtar Kent is Chairman of the Board of Directors of The Coca-Cola Company. From 2009-2017 he served as CEO of the company. He joined Coca-Cola back in 1978 holding several marketing and operations leadership positions over the course of his career. As of 2017 Coca-Cola, incentive formula comprises a base salary multiplied by a target percentage, times the company performance factor. To which the individual performance amount is added. For instance, Mr. Kent with a 200% target got an annual target incentive of $2 million, two times the amount of its base salary. Before we move forward, I’d like to show you why I think Coca-Cola has been so successful over the years and it has nothing to do with its secret formula. Although a few people wonder about Coca-Cola business model (they might give it for granted just like I did not long ago), my curiosity was sparked in the middle of nowhere. As I was traveling toward the Grand Canyon in Arizona, I passed through a town called Dolan Springs. Situated in the middle of nowhere, at 3,400 feet of elevation, with less than four thousand people living there (according to Wikipedia estimate in 2010) I saw one thing that got my attention. In front of a local shop, there was a Coca-Cola automatic distributor. I couldn’t see a single person around, but I could get a fresh Coke! I understand that Coca-Cola is a company born at the end of the 1800s. Thus it had quite some time to get people accustomed to its brand, and taste, as to become a habit (or a vice) for millions if not billions of people (unfortunately I’m one of them). Yet, it doesn’t matter in which country on earth you are Coca-Cola will be there. What’s the secret of this company besides its formula? I bet that is about its business model and its distribution strategy. That’s why I looked into its financials to dissect its operations. Finished product operations generate higher net operating revenues but lower gross profit margins than concentrate operations. In our concentrate operations, we typically generate net operating revenues by selling concentrates and syrups to authorized bottling operations (to which we usually refer to as our “bottlers” or our “bottling partners”). Our bottling partners either combine the concentrates with sweeteners (depending on the product), still water and sparkling water, or combine the syrups with sparkling water to produce finished beverages. The finished beverages are packaged in authorized containers — such as cans and refillable and nonrefillable glass and plastic bottles — bearing our trademarks or trademarks licensed to us and are then sold to retailers directly or, in some cases, through wholesalers or other bottlers. Outside the United States, we also sell concentrates for fountain beverages to our bottling partners who are typically authorized to manufacture fountain syrups, which they sell to fountain retailers such as restaurants and convenience stores which use the fountain syrups to produce beverages for immediate consumption, or to authorized fountain wholesalers who in turn sell and distribute the fountain syrups to fountain retailers. In our finished product operations, we typically generate net operating revenues by selling sparkling soft drinks and a variety of other nonalcoholic beverages, including water, enhanced water, and sports drinks; juice, dairy and plant-based beverages; tea and coffee; and energy drinks, to retailers or to distributors, wholesalers and bottling partners who distribute them to retailers. These finished product operations consist primarily of our Company-owned or -controlled bottling, sales and distribution operations which are included in our Bottling Investments operating segment. Also, in the United States, we manufacture fountain syrups and sell them to fountain retailers, such as restaurants and convenience stores who use the fountain syrups to produce beverages for immediate consumption, or to authorized fountain wholesalers or bottling partners who resell the fountain syrups to fountain retailers. We authorize these wholesalers to resell our fountain syrups through nonexclusive appointments that neither restrict us in setting the prices at which we sell fountain syrups to the wholesalers nor restrict the territories in which the wholesalers may resell in the United States. Our finished product business also includes juice and other still beverage production operations in North America. Our fountain syrup sales in the United States and the juice and other still beverage production operations in North America are included in our North America operating segment. Coca-Cola drinks are available to consumers in more than 200 countries through a network of Company-owned or -controlled bottling and distribution operations, independent bottling partners, distributors, wholesalers, and retailers. This is a massive beverage distribution system able to serve 1.9 billion beverages each day. Georgia a coffee brand sold mainly in Japan. Swire Beverages Swire Beverages Hong Kong, Taiwan, 11 provinces and the Shanghai Municipality in the eastern and southern areas of mainland China, and territories in 13 states in the western United States. This distribution system represented in 2017 the 41% of the total unit case volume. This is a key ingredient to Coca-Cola overall business strategy. As of 2017, the concentrated operations represented 51% of the production compared to 49% for the finished product operations. Net operating revenues were over $35 billion in 2017, compared to over $41 billion in 2016. Coca-Cola distribution channels is also another key element to its overall business strategy. With a massive portfolio of soft drinks with more than four thousand products worldwide; 250 bottling partners, 900 plants, and 27 million retail customers The Coca-Cola system is probably the most extensive distribution ecosystem on earth. Do you want to know who owns Google and who owns Apple?